FESTIVE OCCASION: PM Andrew Holness, Damian Marley, Olivia 'Babsy' Grange and Cindy Breakspeare at Monday's event. JAMAICA’s annual Emancipendence Grand Gala is synonymous with cultural merriment and the kind of euphoric festivities that packs the National Stadium to its capacity. But it’s also a great occasion to reflect on the eventful journey and to honour the achievements and contributions of some of our most outstanding citizens. 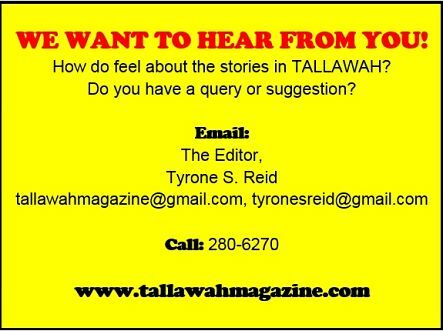 People like Richie Stephens, Stranjah Cole and Damian ‘Junior Gong’ Marley. 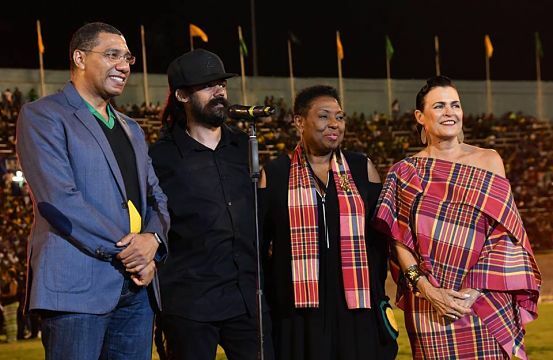 The iconic musicians were specially recognized with citations and awards during Monday’s #Jamaica56 celebrations, with PM Andrew Holness and Culture minister Olivia ‘Babsy’ Grange on hand to make the presentations. Stranjah Cole, given that nickname because he didn’t resemble anyone in his family, is a living legend of the ska/rocksteady era, whose biggest hits include “Rough and Tender,” “When You Call My Name” and “When I Call” (with Patsy Todd). He was honoured for his integral role in pioneering the development of ska and for taking it further afield. Richie Stephens was recognized for putting a modern spin on the old-school sound. In recent times, he’s been working out and touring the continents with Italy’s Ska Nation Band. 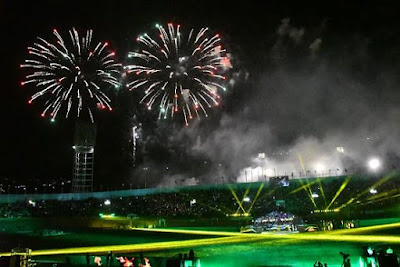 With spectacular fireworks and inventively choreographed routines, this year’s entertainment package was second to none. From Festival Song winner Nazzle Man to gospel stalwarts Sister Pat and Kukudoo, the diversity of the acts on show was remarkable. Tinga Stewart, Wayne Marshall, the National Dance Theatre Company, the Kingston College Chapel Choir, the Ruff Kut Band, Sanchez and countless performing arts groups all pitched in to make the cultural celebration both magical and memorable.